I’m finally over that red-eye jet-lag following a bite of the Big Apple. It was the second bite I’ve had in the last 14 years and what a bite. The last few days back home in my bubble outside Paris, I’ve been on a more nocturnal rhythm with a head still buzzing with the noises of NYC. Manhattan certainly is a cocktail with a punch. No Standing, No Stopping, No Way – it’s Broadway! Broadway’s place to eat has to be at the NoMad Restaurant at 1170 Broadway. I love the service in NYC! Elizabeth Merner, our smiling server extraordinaire confirmed my choices on the menu were her favourites: I’m still dreaming of that appetiser of strawberry gaspacho, basil and smoked duck. Although we resist tasting French wines in the USA since America has so much to offer, Liz served us an incredible Macon Vieilles Vignes 2008 for an apéritif the next time we popped in (we couldn’t resist returning.) Like Daniel Beedle, the Sommelier, they understood our tastes so we were thrilled with their choices, even if a couple were from France! Inspired and wanting a taste of more US blockbuster wines to bring home, we headed to Morrell, NYC’s institution. Perhaps it was just an off day, but they weren’t friendly. I’m perhaps cynical as I become older but why give business to people who don’t want to serve you? The moral of the story? Listen to Daniel. When in NYC and looking for wines, head to Astor Wines in Soho. With our amazing wine consultant, Duncan McRoberts, we have our favourite gutsy, buttery, toasty – even wooded (if not fashionable but we love it) – Californian Chardonnays. ‘You mean you’ve not tried any macarons yet? 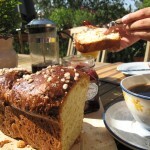 But it’s your duty, girl!’ exclaimed Carol Gillott, of Paris Breakfast fame. The last time we met, I dragged her to the Paris suburbs for a macaron workshop chez moi. This time she wanted to meet up so she could show me some macaron spots in NYC. By the time I surfaced that morning and switched on my phone after 9am, she’d sent me 3 emails from 5.30 am to check I was up. I wonder when Carol sleeps? First stop was La Maison du Macaron (132 W.23rd Street) with basil-lime-ginger and Graham-Cracker-Key-Lime-Pie macarons (using French meringue, same as the macarons in my book). Perhaps it was too early after breakfast, since I didn’t get much flavour but we didn’t wait the dutiful 15 minutes until they were fully at room temperature. So, where were the Big Apple macs? 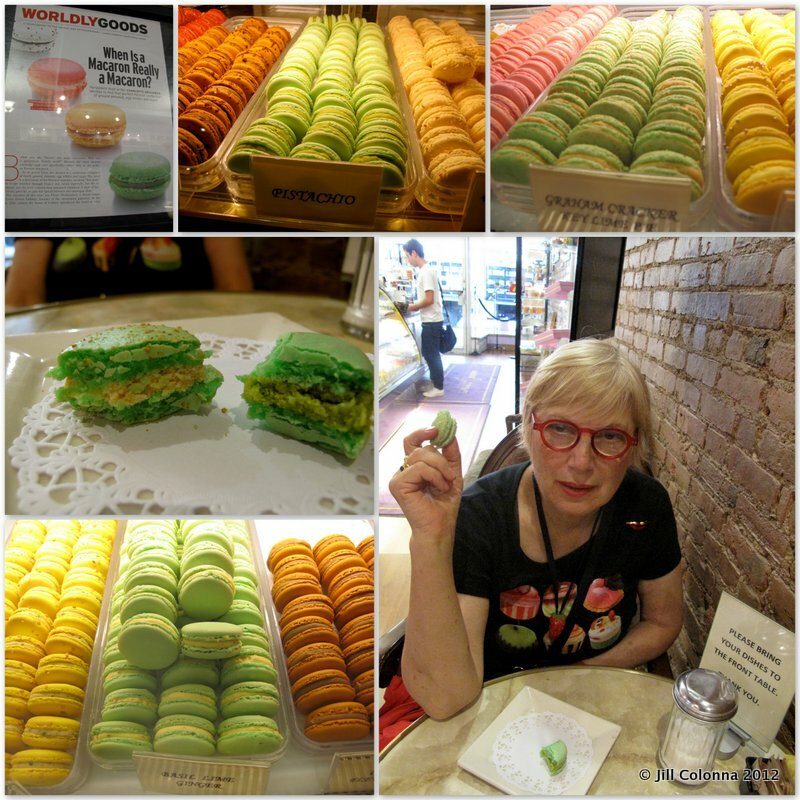 Tasting French macarons with Carol Gillott – this was my NY breakfast! 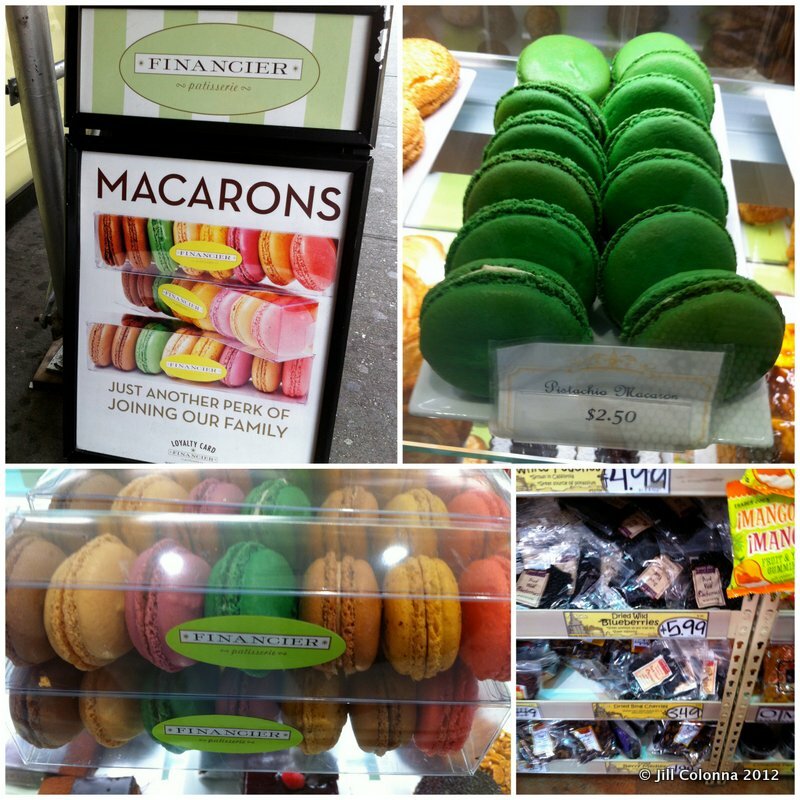 More bright green macarons were at Financier, reputed for the best macarons in NYC and where their financiers are perfection. You know how I feel about pistachio macarons and colouring. Next stop? I had to check out Trader Joe’s – Carol showed me the free coffee as we waited in line, now that is service! My basket was filled with dried cherries, something you can’t find in Paris. 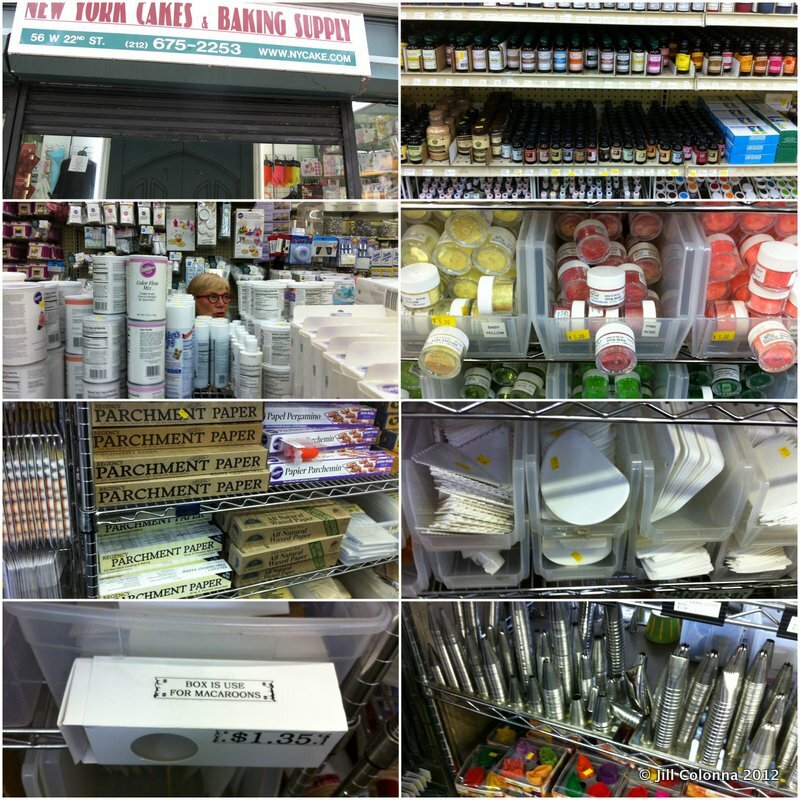 Carol realised how goofy I was when she took me to N.Y. Cake on 56 West 22nd Street. With macaron gift boxes and everything you can imagine to make macarons and more, I just couldn’t contain myself. I think she started to pretend we weren’t together when she asked me to speak French. After the sweet meet-up, Carol put me in an arty mood so there was nothing better than to have a taste of the Frick Collection and the Museum of Modern Art. 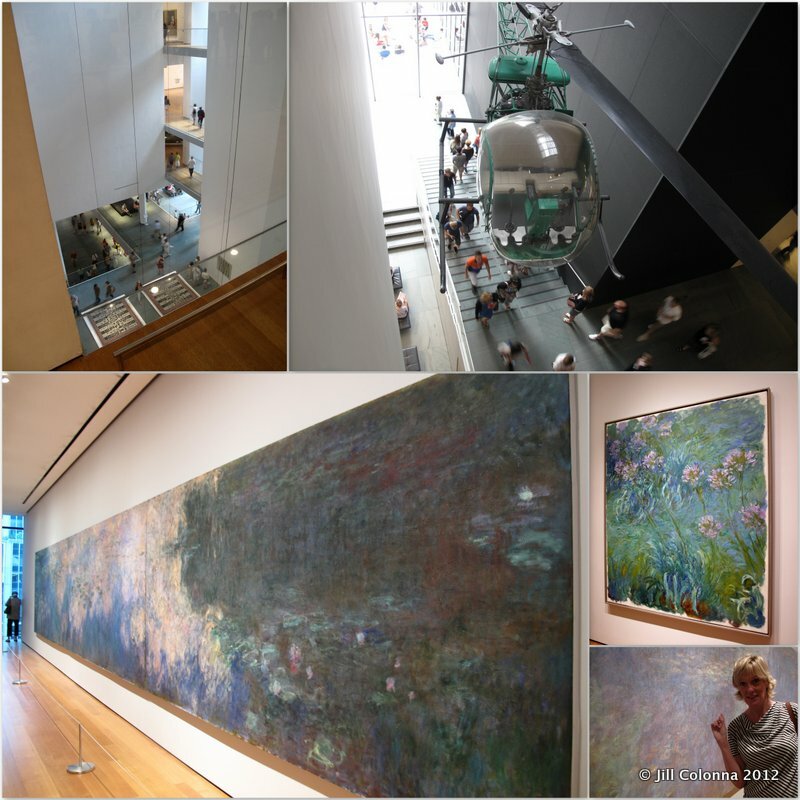 Gigantic MoMA has such an impressive wealth of art treasures. In awe of more of Monet’s Water Lily paintings following our trip to Giverny this summer, Catherine and Paul in the restaurant (where else would you find us?) told us about the new Giverny – in NYC Botanical Gardens! I couldn’t get enough of this Manhattan Cocktail of art and checked out just a part of the Metropolitan Museum. Just an insy-winsy taste left us completely punch drunk! 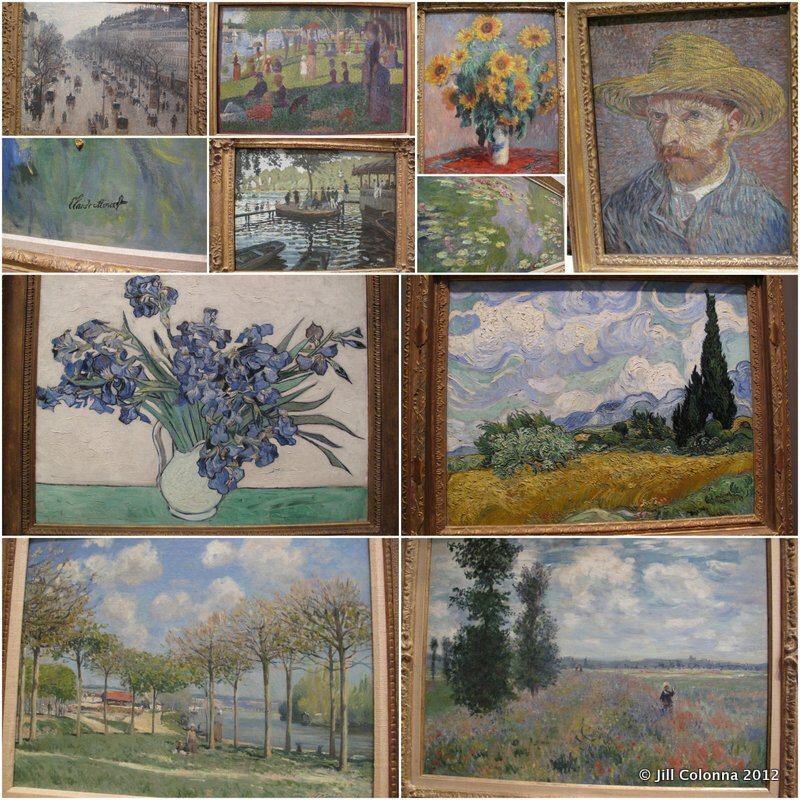 It’s mind-blowing to see works that were painted only up the road from where we live on the Seine. Punch drunk at the Met. The last part of the Manhattan cocktail left me rather shaken. Thursday night, Antoine and I were strolling (no, walking fast) past the Empire State Building and I decided not to visit it next day since I’m no longer good with heights. On Friday morning, I was only 2 blocks away from the shooting at the ESB and as 4 helicopters hovered above later, I couldn’t stop thinking that we should never take life for granted. This statue was a statement outside the Caen War Memorial Museum this summer. Back to the more stirring cocktail in Manhattan. More eateries we adored centred on Italian: from a crowded Eataly (where you shop, eat sitting down/standing up or eat standing hiding in a corner); to Lombardi’s first NY pizza; to Peasant in Nolita where the food is cooked on a homemade wooden oven built by the chef, Frank de Carlo. His white pizza and wooded quail are begging for me to return to NYC. 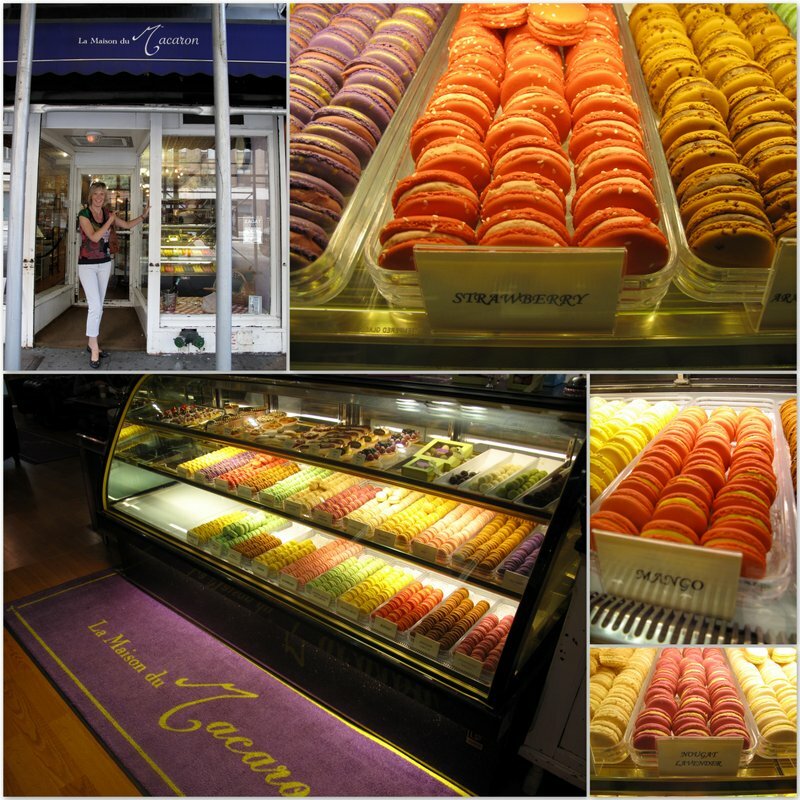 I loved seeing macarons in many cafés and bakeries, such as Screme (best espresso next to Grand Central Station), Bouchon and of course, Maison du Chocolat. There are no doubt many more but as the French say so well, everything in modération! I’ve rambled on enough since I didn’t have time to do a short post – it’s a mad week returning to school, organising my students, chocolate walks in Paris etc. We love routine, don’t we? Let me just leave you with one question: am I imagining this? 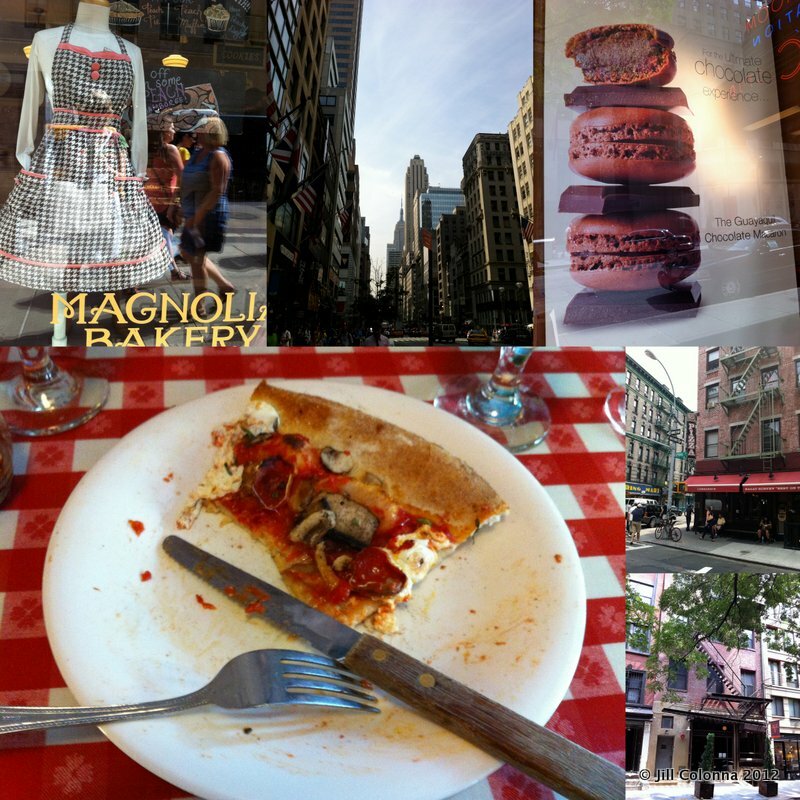 Have you noticed that plates in NYC are small for big portions and in Paris, the plates are huge for smaller portions? Just saying. Wow!! Another wonderful wrap up. Again, I’m so envious. New York is SUCH a different world from my sleepy surf town here near San Diego. I’m eager to see it, but I know I’ll be ever so thankful to return to my beach. The one photo that is so familiar is that Trader Joe’s shot… I have three of them within 5 miles of my house. It’s just about the only place I shop!! Sounds like a wonderful trip Jill! I enjoyed reading about the experience and all the photos! 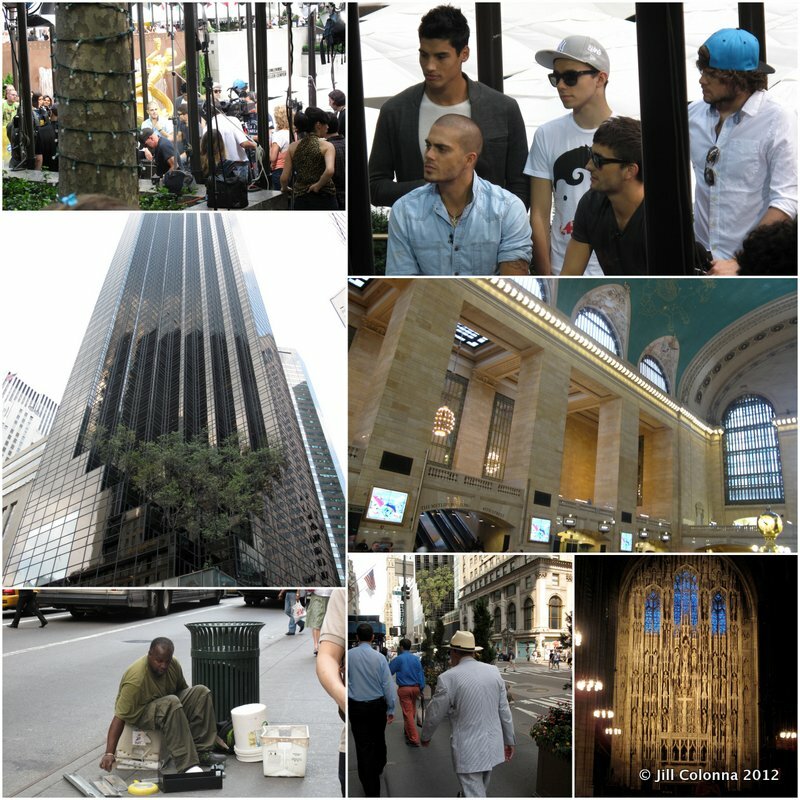 Funny about having a pic of The Wanted and not knowing it ;)! Looks like you got to enjoy lots of delicious foods as well! Ha! I’m definitely one of those speeding NYers… I swear it’s just my natural pace. And I am WAY polite to tourists – it just takes forever to WALK versus DRIVE somewhere 🙂 So glad you enjoyed yourself, and that you were safe from that shooting – it was an insane morning here again. Truly a reminder never to take life for granted. And yay for stopping at NY Cake! That place is horribly expensive for me – only as I can’t go in and ONLY get what I came for 🙂 Kiss from NYC. What a whirlwind! I’m with you. 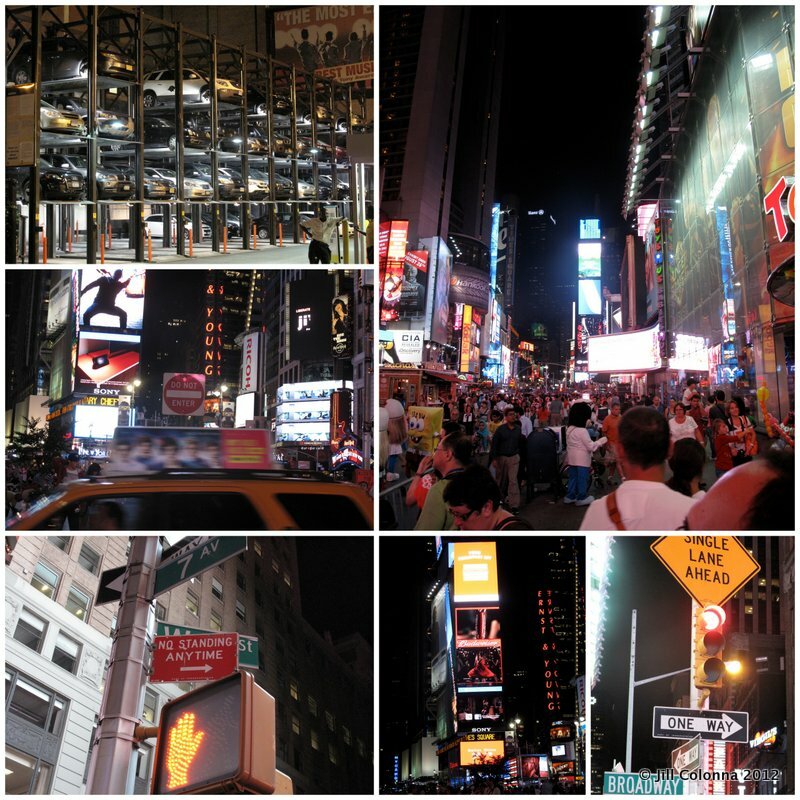 I go to NYC and I’m like ‘slow down, people!’ But sometimes its nice to be all fast-paced and go-go-go. I’ve scribbled down all these macaron places for the next time I’m in NYC! I only go there to eat and these have zoomed up to the top of my list because you know…there’s still no macarons in Cayman! What a FUN writeup and lovely to see Carol there! I NEED to get to NY Cake next time I am there. With an empty suitcase. Glad you had an amazing trip to NYC! I have never been there but would love to visit one day. Lots of macarons even from breakfast! 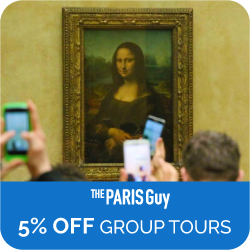 Do you think it’s a big difference from ones in Paris? If so I wonder what’s different. I have only tried ones in the US and Japan. Def need to check out from France! I know, how life is uncertain. I’m glad you are home safely!! The NY Cake… have to go there! What about Magnolia Bakery? Received the book as a present, but not yet got round to baking anything from it yet.. you? No macarons at Magnolia, Yvette. They had tons of cakes. Frosting. So used to wonderful Parisian pâtisseries that I’m guilty of being a snob. I did love their apron here in the window. The print is very tendance in the fashion stores right now in town. Wow. What a wonderful whirlwind trip to NYC. You certainly packed a lot in. NY Cake is bad for me. I stand mesmerized by the disco dust selection, can’t decide and then walk away with way too many. 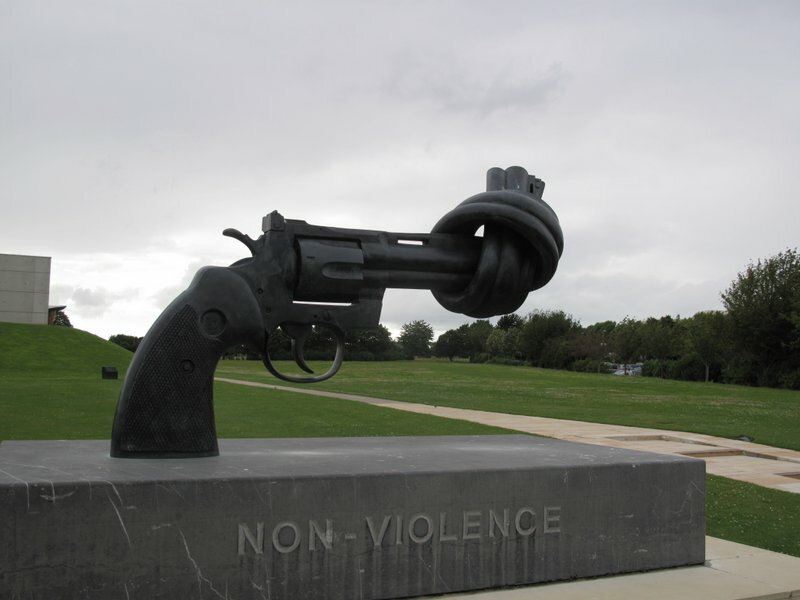 There is a similar gun statue at the UN which has a very interesting tour next time you are in town. I was a block away when the shooting happened walking down 32nd street on my way to Penn Station. Crazy. Aha – I also came away with disco dust. It looked so 70s/80s! So much to see – yes, next time indeed. Madness that you were not far away too! Funny world. Next time come have drinks on our terrace in the East village. Oooh..Lora, you know how to tempt, don’t you? I can just see these sweet pots of herbs you were talking about. Sounds wonderful. Motivation for another trip, I hope. Looks like you had an amazing trip and so many macarons. Thanks Rachel. 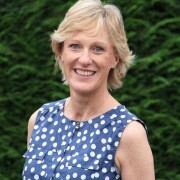 Yes, client is king with service, which is wonderful! I was gonna tell you to go to Lombardi’s for pizza and forgot!! I know, I know. I should have tried it but I wanted pizza. Will have to come back. PULEEZE put one of those black bars over my red glasses. I must return the favor!! Overwise you covered a LOT of turf in NYC Girl!! Och. You look fabulous!You have amazing red glasses – I just have a red nose.